"At the moment, a UAV's range and endurance is constrained by the amount of fuel that can be stored on board. As you add more fuel, the weight of the aircraft increases, which means more fuel must be consumed to stay aloft." 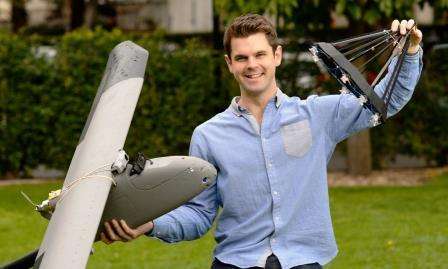 Working at the University's Australian Centre for Field Robotics and Marulan air strip, Daniel used a combination of precise measurements from an infrared camera, with GPS and inertial sensors to allow the sky-high docking to occur. "Aerial refuelling has been used with manned aircraft, but to the best of our knowledge, UAV airborne docking had not been demonstrated prior until our experiments late last year. The biggest challenge is the highly accurate and reliable relative positioning performance to allow a second aircraft to dock with a small target, in the air, and amidst turbulence," states Daniel. Daniel says: "This type of technology is useful in situations where greatly extended persistence over an area is desirable, such as the search for the MH370.It would allow aircraft to use their fuel to search the target area, rather than flying back and forth from land. It could also be used to keep high-flying UAVs airborne, in place of satellites for communication." As part of his ongoing efforts to meet the engineering challenges, Daniel developed an autopilot and rapid software development process which twice won him the International Simulink Design Challenge. "There are two autonomous aircraft, a leader and a follower. The leader tows a cone-shaped, parachute-like drogue. The objective is for the follower to autonomously dock its nose, within the drogue." "Initially both the aircraft rendezvous to a formation positionwhere the follower's infrared camera can observe infrared LED markers on the leader's wingtips and tail." Once docked, the follower is commanded to station for a certain amount of time to simulate refuelling or recharging. The follower disconnects and resumes its mission." "In addition to docking, this system could be used for any application that requires highly accurate positioning, relative to a static or moving target. This could include, precision landing on ships, net recovery or close formation flight," says Daniel. The complete results of Daniel's 4 year research project co-supervised by Professor Salah Sukkarieh and Dr Ali Goktogan will be described in his PhD thesis "Guidance, Navigation and Control for UAV Close Formation Flight and Airborne Docking" scheduled for publication later this year.